Just in case you haven't realized it by now, I am going to say this again: I love beauty products (skin care and makeup). I am blessed with a mother and grandmother who loved taking care of themselves and always made sure they walked out consistently well-groomed. I was really delighted when around the middle of this year, BLUSH Magazine came out with its maiden issue. A magazine devoted exclusively to a lifestyle of beauty -- I know a lot of women like me were saying "Finally!" 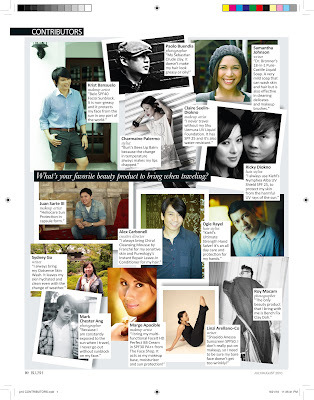 For BLUSH's September/October 2010 issue, I had the privilege of contributing to its regular "First Person" section. It was really fun talking about staying beautiful in times of traveling through many cities. If you live in Metro Manila or any major city in the Philippines, I would like to invite you to grab BLUSH magazine's latest issue, check out the article I wrote, and discover beauty lessons from the point of view of the experts.